Stuart tells Toadie that he has feelings for Flick- he thinks he loves her. Chloe tells Darcy that John wants to divorce her. Toadie is on the phone to Dee who is in Tasmania for her grandmother's party. When the call is done he jokes with Flick how funny it would be if their two families got together. When Chloe returns from her break Flick takes the opportunity to ask Chloe if she would be willing to have a meeting with Stuart about him becoming the hotel's usual limo driver. Chloe is not keen as they have a limo service, even though both Flick and Toadie think that they are unreliable. Chloe tells Flick that which limo service the hotel uses has nothing to do with her, and promptly vetoes the Stuart idea. Susan is telling Darcy that things are getting a lot more familiar to her, and she thinks that her memory is starting to unlock. Darcy thinks it's great and she is becoming back to the real Susan, and asks her if she is still going to go through with the divorce. Susan however is fed up talking and thinking about it, and asks Darcy to drop it. Whilst on the subject of divorce, Darcy mentions to Susan that Chloe and John are getting a divorce. Susan is quick to assume that it is because of Darcy, but he assures her that he is nothing but a friend to Chloe. The trouble is he doesn't know how deeply he wants to get involved. Susan thinks this is because he doesn't know how to be 'just friends' with a woman, to which Darcy agrees. Susan's advice is that if he an be 'just friends' then do it, but if he can't do that then he should just stay away. Boyd has invited a few friends over and the mess they are making and the fact that they are watching a horror movie, which sounds scary with the mention of the axe murderer, has upset Summer. 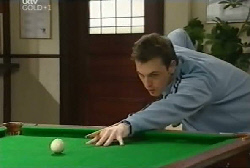 She tells Boyd that Max will be angry with him, but when Max does get home, Summer's attempts to get Boyd into trouble fail, as Max is pleased that Boyd has made friends, and tells the group that if any of them want to stay for dinner he will order a take-away. Boyd and his mates seem chuffed, but Summer looks a bit put out. Darcy arrives to tell Chloe that he is worried about her. Chloe is surprised by this, and tells him that she should not have let it get the better of her. Darcy says that maybe she needs some company, and with a smile she agrees that she does and invites him in. Stuart is pleased to see Flick at the door, hoping that she is there to have that drink, but she says that actually she is there to tell him about the limo business, and Chloe would not agree to a meeting. Stuart says that he appreciates that she tried. Flick awkwardly tries to leave, but Stuart asks her to come in as they need to talk. He asks what they are going to do about their feelings? Flick says that she doesn't want to hurt Steph, but Stu says that he can't go on like this. When he tries to kiss her she pulls away, but admits that she feels the same way. They agree that they have to talk to Steph about the situation, after all she may not even care. Flick decides that it is something that she has to do alone, as it is between she and Steph. Are there going to be any barriers to Stick the funniest named ship ever. Angie and Kev arrive at the pub arguing and bickering amongst each other, but when they go inside they find that Toadie has thrown them a surprise party for their anniversary. Lou tells the couple that they are as pretty as the day they got married, especially Kev. Angie tells Toadie that she is proud of him for putting it all together for them. Max decides on fish and chips, telling the kids that it's great that you don't need any plates. Summer says that she used a plate. Boyd tells her that guys don't worry about stuff like that, but as Summer tells him 'Guys are pigs' Max proclaims that it is bed-time, ignoring Summer's protests. Boyd asks if he can stay up a bit later so that he and Max can watch a Clint Eastwood marathon, Max agrees as he wants to see 'Dirty Harry' Summer asks if she can watch it too, but 'Dirty Harry' is not something that Max wants Summer to see just yet and sends her to bed. Summer looks even more disappointed. Chloe tells Darcy that what makes the divorce even more awkward is the fact that they are business partners, in fact that there is a luncheon on tomorrow and he was supposed to attend. Darcy offers to go to the lunch with Chloe, as a friend, if it would help. Chloe makes it clear to Darcy that she is not interested in having an affair. CHLOE: You have to understand Darcy, I'm not interested in having an affair. DARCY: Chloe! That's the last thing on my mind. CHLOE: Sorry. In any case, I am sure you can do a lot better for yourself than a middle aged divorcee. CHLOE: Thank you. And I guess I could use a little support tomorrow. DARCY: Then I will be here. Angie is wowing the crowd at the anniversary party, telling them that she is waiting for her anniversary gift. KEV: I've just been waiting for a guy to turn up and drive you away in it, and leave me in peace for a while. She and Kev continue to rib each other, not sounding as if they want to be together, it all seems to be in jest, but Toadie has a look of concern on his face. Flick runs into Stu as she is taking Harvey for a walk. Stu has been waiting for her to call, Flick says that she has tried to talk to Steph, but she thinks it may all be too soon. Stu doesn't seem very pleased, but Flick isn't budging. Max and Boyd are enjoying the film. MAX: You know I first saw this with my dad when I was about your age. BOYD: Yeah? Did he let you have a beer? MAX: No he didn't actually and I'm not going to let you have one. Summer appears to announce that she can't sleep, and wants to make some popcorn. Max says that she is not old enough to watch the movie, and she has to go to bed. He promises that the next time something is on that she wants to watch he will let her stay up and watch it and he will watch it with her. Summer is sent to bed, but when she gets into the hallway she is a little tearful and looks like she is feeling a little left out. Summer is telling Max that she didn't sleep well last night, what with all the noise he and Boyd were making watching the movies, it means that she 'really needs' a coffee. Max offers her a babycinno, but she says that they are just 'froth for babies' seems as though Sum is in a hurry to grow up. Flick is sitting at a table when Chloe comes in and asks to join her. She apologises for jumping down her throat about the limo business, and that she was upset about something else and took it out on her. Chloe thinks that they should give Stuart a trial run, and asks Felicity to organise a meeting for her. Toadie arrives deep in conversation on his mobile. It's Dee. He tells Angie and Kev that Dee's gran has had a bit of a turn after the party, so she has to stay in Tasmania for a bit longer, Angie and Kev hope that she will be back before they leave, as they want to meet her. Toadie says that hopefully she will, but he doesn't know. Darcy is proving quite a hit at the luncheon, the ladies there love him. Chloe tells her that she is proud of him, as apparently he has been making himself some fans. Flick comes to speak to Stuart. Stu thought that they were supposed to be avoiding each other, but Flick tells him that she has some good news, Stu automatically assumes that Flick has spoken to Steph, but actually it's just to tell him about Chloe offering to give him a trial. Nevertheless Stuart is pleased with this, it's great he's going to give him a chance. He really appreciates it, and to show that he gives Flick a big hug. Darcy tells Chloe that he is having fun, he's glad he came, as he has made a few contacts that won't do him any harm. Chloe thanks him for being there, as it has made things a lot easier. Suddenly Darcy decides that he has to leave, he thought he was there as a friend to Chloe, but he thinks that she is looking for some sort of 'toy boy' and storms off.